Terrestrial ferns. Rhizomes erect, sometimes forming short trunk-like stems, hairy at apex. Fronds monomorphic or dimorphic, not articulated to rhizome. Stipes with 2 lateral wings (stipules) at base, glabrous or hairy. Laminae 2–3-pinnate, catadromous, glabrous or hairy. Veins free. Sporangia not in sori, partially or completely covering abaxial surface of fertile lamina segments, or completely covering highly modified and reduced lamina segments; paraphyses absent; exindusiate. Sporangia with a group of thickened annulus cells at one side of the capsule, dehiscing by a longitudinal slit over the apex; maturing ±simultaneously; usually hundreds of spores per sporangium. Homosporous; spores trilete, tuberculate, chlorophyllous. A family of four genera (Metzgar et al. 2008) and about 20 species (Smith et al. 2006). 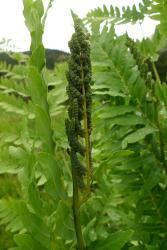 The family is interpreted here to include four distinct genera: Leptopteris, Osmunda, Osmundastrum and Todea. Based on phylogenetic analysis of plastid DNA sequences, Metzgar et al. (2008) showed that Osmundastrum, with a single extant species, is distinct from Osmunda and sister to the rest of the Osmundaceae, and that four genera should be recognised rather than three, as in previous treatments (e.g. Smith et al. 2006). The four genera are well supported by both molecular and morphological evidence. Species are reasonably well defined in Osmundastrum (1 species), Leptopteris (6–7 species) and Todea (2 species). Metzgar et al. (2008) recognised three subgenera in Osmunda but species estimates vary between seven and 30, with nine recognised by Kramer (1990), excluding Osmundastrum. 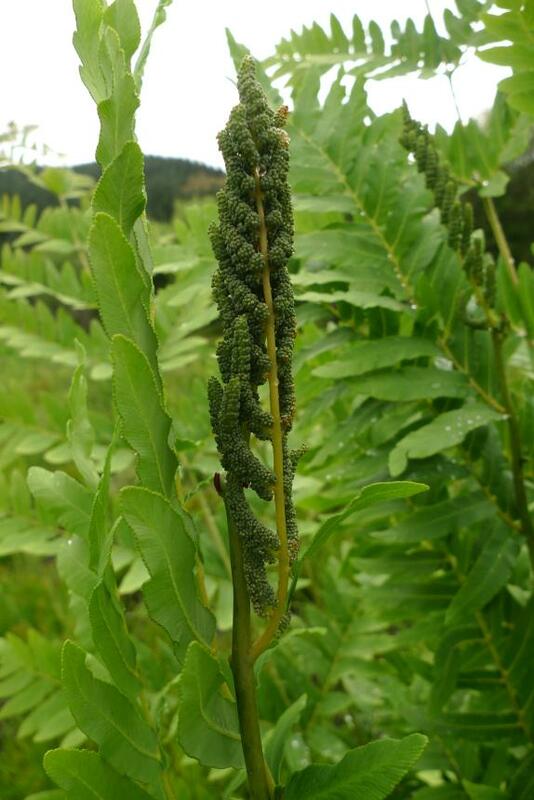 The family is represented in New Zealand by two indigenous genera (Leptopteris and Todea) and one fully naturalised genus (Osmunda). The family name Osmundaceae was attributed to Berchtold & Presl (1820) by Pichi Sermolli (1970). Berchtold & Presl treated Osmundaceae at the rank of “řad” (order), but Pichi Sermolli argued that this should be regarded as equivalent to the modern family. However, a change to the rules of botanical nomenclature in the Vienna Code of 2006 (Art. 18.2, Note 1, Ex. 4) specifically states that “names published at the rank of order (“řad”) by Berchtold & Presl (1820) are not to be treated as having been published at the rank of family, since the term family (“čeled”) was sometimes used to denote a rank below the rank of order”. The name Osmundaceae was attributed to Martinov (1820) by Smith et al. (2006). The Osmundaceae comprises terrestrial ferns characterised by stipules at the base of the stipe, sporangia not aggregated into sori, each with a lateral group of annular cells opening by a longitudinal slit, green spores, and a base chromosome number of 22. Distributed in north and south temperate regions, and in tropical south-east Asia. Two non-endemic and one naturalised genera with four species in New Zealand. Berchtold, F.W., von; Presl, J.S. 1820: O přirozenosti Rostlin. Krause, Prague. Brownsey, P.J. ; Perrie, L.R. 2014: Osmundaceae. In: Breitwieser, I; Heenan, P.B. ; Wilton, A.D. Flora of New Zealand — Ferns and Lycophytes. Fascicle 4. Manaaki Whenua Press, Lincoln. Kramer, K.U. 1990: Osmundaceae. In: Kramer, K.U. ; Green, P.S. Pteridophytes and gymnosperms. Vol. 1. In: Kubitzki, K. (ed.) The Families and Genera of Vascular Plants. Springer-Verlag, Berlin. 197–200. Martinov, I.I. 1820: Tekhno-Botanicheskīĭ Slovar'. St Petersburg. Metzgar, J.S. ; Skog, J.E. ; Zimmer, E.A. ; Pryer, K.M. 2008: The paraphyly of Osmunda is confirmed by phylogenetic analyses of seven plastid loci. Systematic Botany 33(1): 31–36. Pichi Sermolli, R.E.G. 1970: A provisional catalogue of the family names of living pteridophytes. Webbia 25(1): 219–297.